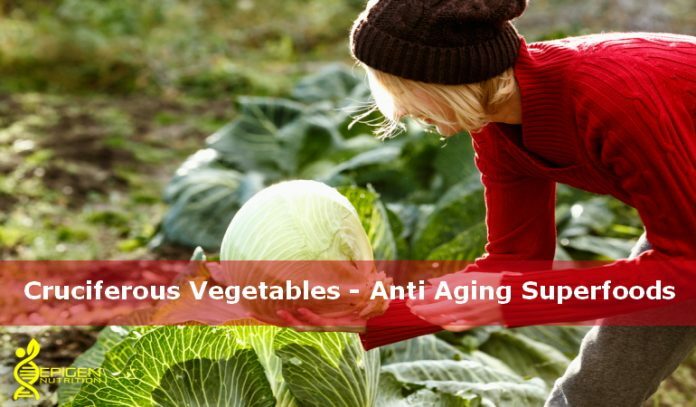 If you are looking for great a source of foods that are chock full of antioxidant plant compounds to help you try to slow down your age clock, then look no further than the cruciferous vegetable shelves of the veggie sections in your favourite supermarket. Not sure which ones you should be eating? Well here’s some to get you started that you should consider adding to your shopping list the next time you go. Although this isn’t the full range of what you should be including in your diet, (in fact there are tons more I could have added), those mentioned are the most common ones that you will be able to find in your shops. And they contain more than enough nutrients to help deliver the anti-aging effects that you will be looking for. Ok let’s get onto the good stuff and look at some of the actual benefits that you can expect to see from eating these nutrient packed vegetables. I hope after reading this you will be compelled to include at least some of these every day in your meals. Although a diet that is low in processed carbs and sugar is the number one way to prevent the likelihood of developing diabetes, new research is looking at cruciferous vegetables and cauliflower in particular which may have a role in aiding the prevention of diabetes development. While the exact details behind this research have still not been fully revealed, it is believed that it maybe be related to reducing glucose insensitivity, and helping to maintain optimal blood glucose levels. There are loads of factors that can contribute to aging, and a weakened immune system is a big one of those factors. Cruciferous vegetables are some of the most effective immune boosting foods available to us, and they contain a unique blend of phytochemicals to keep our immune systems primed for defense. Our immune cells actually kill off dozens of cancer causing cells every day, so it is important to keep them equipped for defense. Inflammation is essential for our bodies to arrest abnormal processes, but this inflammatory process can quickly get out of hand and cause damage to unrelated organ systems. A lot of the phytonutrients and vitamins found in cruciferous veggies serve a double purpose of being antioxidant and anti-inflammatory, both of which help to prevent premature or accelerated aging. B vitamins are not often taken into consideration regarding a role in aging, but the simple fact is that they can make or break you. B-vitamins have the property of affecting metabolism in your body, ensuring the major macronutrients are sufficiently broken down and absorbed to initiate repair and recovery. Although most of us get enough B-vitamins in our regular diets, eating cruciferous veggies to ensure you get more can’t really hurt, as the B-vitamins are water soluble and are passed out in urine whenever there is too much of them. There have often been cases of people who are physically fit and strong, but have developed a rapidly deteriorating brain. In these cases, faster aging is guaranteed, because the brain can no longer effectively manage the body. This is another area where cruciferous vegetables stand to benefit you. Research has shown that choline which is found in these vegetables can assist in warding off dementia, along with the Vitamin K, which can inhibit advancement or development of Alzheimer’s disease. So these along with Sulphur rich compounds and other vitamins can help to ensure that your brain is kept in an efficient and healthy state as possible. The other chief player in accelerated aging is the inability to be able to move freely. This regularly comes around as a result of inflammatory joint disease, or a loss of bone mass, both of which lead the way to being incapacitated. Cruciferous vegetables have already been established as anti-inflammatory, but they also contain essential bone building minerals such as calcium and magnesium, which is surprisingly deficient in quite a lot of people’s diets. To aim for optimal health try to get some cruciferous vegetables on your plate at the very least 3 to 5 times per week.